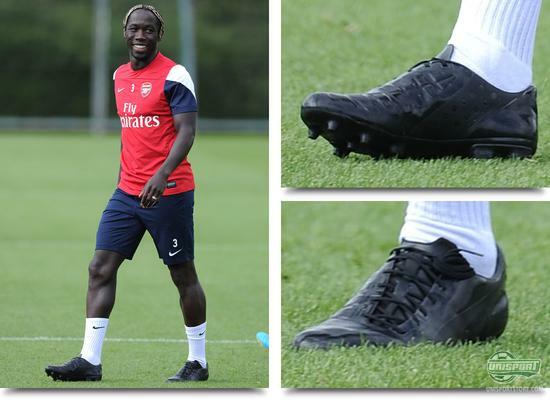 In this round of boot spots we take a closer look at Bacary Sagna, who has been training in a new, blackouted prototype boot from Puma. There has generally been plenty of blackout boots this week, which have been mixed with the now almost obligatory switches to the Hypervenom and Nitrocharge. Several leagues have already been kicked off and with just a week until the Premier League gets up and running, the long, football-free summer looks to finally be over. In the weekend Manchester United played in the Community Shield and beat Wigan, which got The Red Devils off to a good start to their campaign. But it is not just United who will be looking for silverware this season and therefore we have seen a step up in the intensity of training around Europe, as the start of the season draws closer. 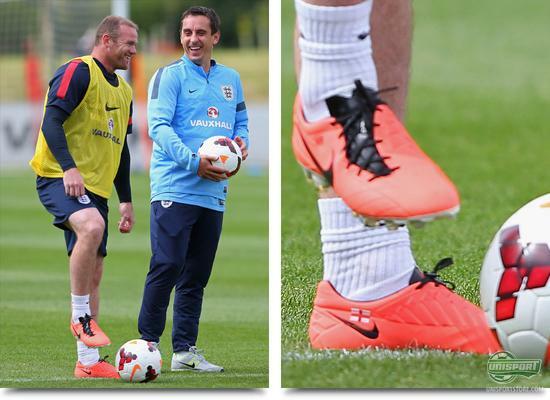 Wayne Rooney (Manchester United)  Nike T90 Laser IV Mango/Black Hey, wait, what? One of the summers most discussed players showed up to International training wearing a pair of quite interesting boots  because even though Wayne Rooney is a front figure for the Nike Hypervenom Phantom, he still showed up wearing his old T90 Laser IV. Whether Rooney had just forgotten his Hypervenoms, or if he really prefers his T90 remains to be seen. Bacary Sagna (Arsenal FC)  Blackout Puma-boot Arsenal right-back Bacary Sagna trained in something very interesting this Friday. The quick defender is known for wearing the Puma Powercat 1.12, and this suggests that Puma have asked Sagna to test out a new power boot. In any case Sagna's blackout model could look like a new Powercat, with the strike elements on the instep and a solid build. At the same time the boot looks to have the EverFit Cage-structure on the outside of the boot, as well as conical studs underneath the front foot. What Puma have in stall for us, only time will tell. 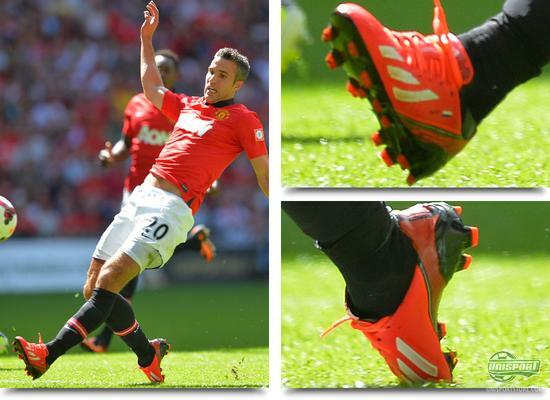 Robin van Persie (Manchester United)  Adidas F50 Adizero Infared/Black/Running White Around this time last year Manchester United unveiled the signing of Robin van Persie and a year later, he is two trophies richer and indisputably their biggest star. The Dutchman is in a league of his own and proved it by winning The Red Devils another trophy, when he scored both goals in a routine 2-0 win against Wigan. 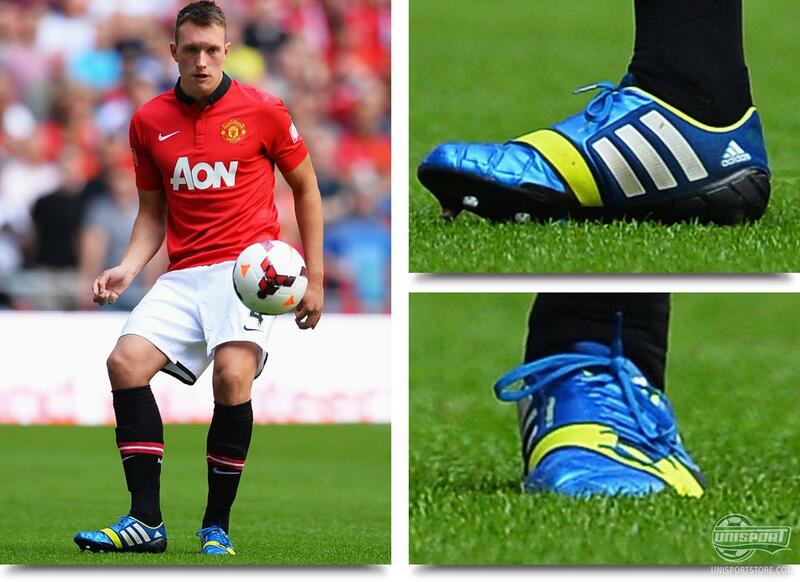 He did so wearing the Adidas F50 Adizero, which he looks like he will be wearing next season. He has previously been a big fan of the Predator-collection, but their looks to be goals in his new Adidas F50 Adizero with an AdiPower-sole. Phil Jones (Manchester United)  Adidas Nitrocharge 1.0 Blue Beauty/Electricity/Running White Now that we're covering Manchester anyway, why not take a look at the versatile dynamo, Phil Jones, who yesterday both played as a central midfielder, centreback and right-back. He worked his socks off, as he always does, while wearing his Nitrocharge 1.0, which he looks to have fallen for, after several flirts with other boots. He has previously tried out the Nike Tiempo Legend IV, after leaving Puma, but now it looks like Adidas' new boot silo has taken over. 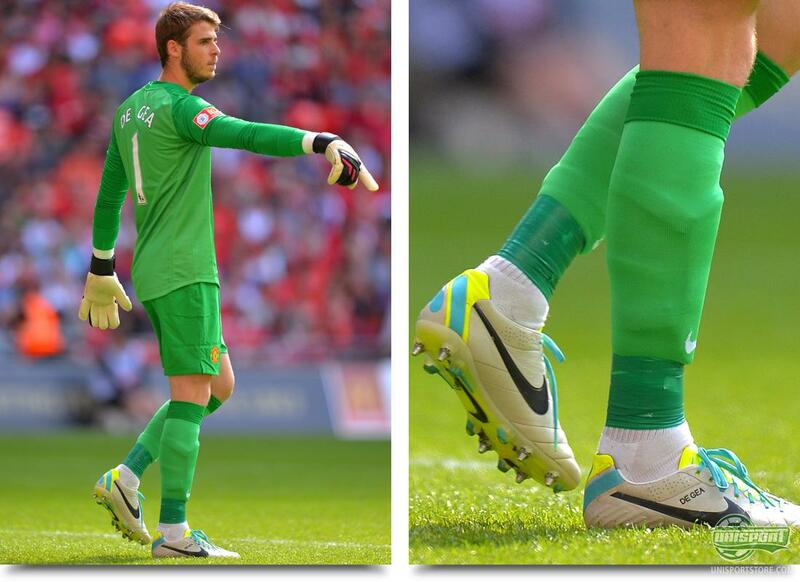 David De Gea (Manchester United)  Nike Tiempo Legend IV Light Bone/Black-Volt Alright, one last United boot spot. This time in the shape of their young goalkeeper, David De Gea, who kept a clean sheet in a pair of Nike Tiempo Legend IV Light Bone/Black-Volt. This is something completely new for him, as he under Alex Ferguson was under strict orders to only wear black boots. Fergie was convinced keepers should only wear black boots, as they should focus on their keeping rather than their boots. David Moyes looks to be slightly more lenient in that respect, so De Gea has pulled on the new slightly flashy colourway of the Tiempo. 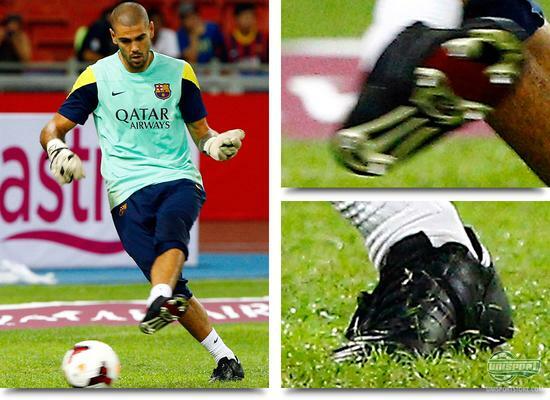 Victor Valdes (FC Barcelona)  Adidas World Cup Blackout From a goalkeeper wearing white boots, to one completely in black. Victor Valdes was recently unveiled as a new Sells keeper and this saw the end of his partnership with Brazilian sports brand Penalty, who previously supplied him with gloves and boots. This lead to the question, what would Valdes wear now? It looks like he has gone for the classic option, pulling on a pair of Adidas World Cup  a great choice, with solid leather build and iron studs. This also suggests that the Barca keeper shares Sir Alex' view of goalkeepers and boots. Steven Gerrard (Liverpool FC)  Adidas Predator LZ II Ray Green/Electricity/Black & Adidas Adipure 11Pro Running White/Metallic Gold/Black We also need to cover Steven Gerrard, who has been one of the summers big talking points, when he was first spotted in the Nike CTR360 Maestri III, then later the Adidas Adipure 11Pro. The explanation at the time was that the loyal Predator-man was struggling with his specially made Predators. 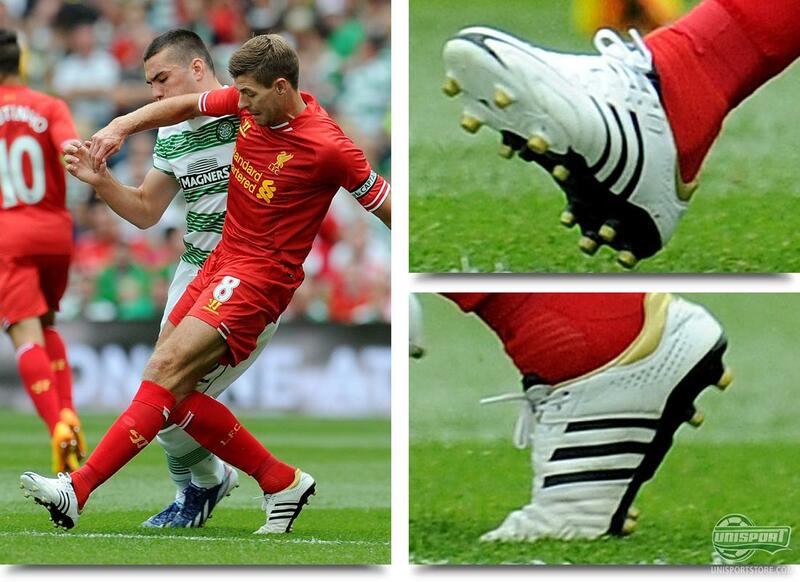 So to finish Liverpool's tour of Thailand, he had a pair of Adipure 11Pro delivered. 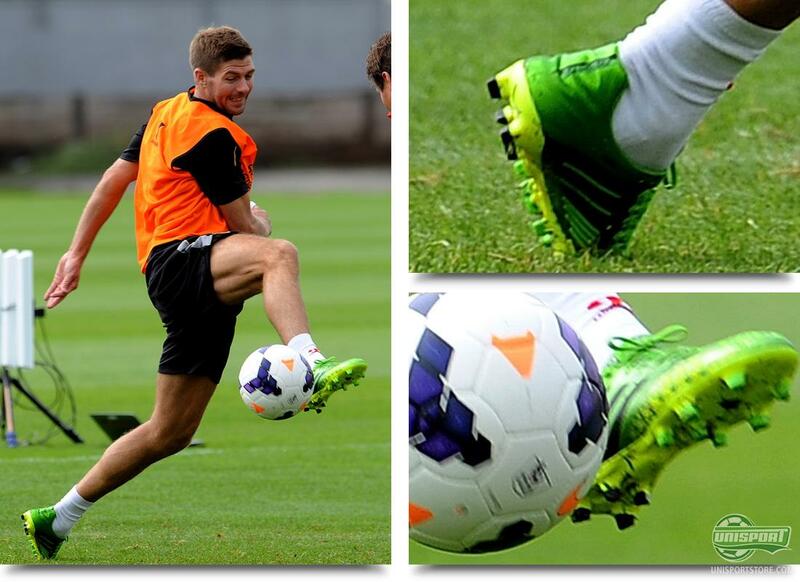 Now Liverpool are back from Thailand and Gerrard is back in the Adidas Predator LZ II. What then confuses us is that he in the game against Celtic still wore the Adidas Adipure 11Pro. Maybe he was impressed with the Adipure during the short stint and is struggling to let go. Ricardo Carvalho (AS Monaco)  Adidas Predator LZ Yellow/Black And if you have a pair of football boots, then it can be very tough to give them up  and it may even be unnecessary. AS Monaco's Ricardo Carvalho looks to be very happy with his Adidas Predator LZ Yellow/Black and the old Chelsea and Real Madrid defenders doesn't look to have seen reason to replace his old boots. 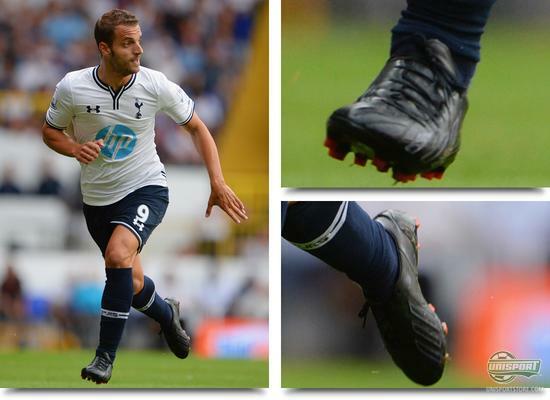 Roberto Soldado (Tottenham Hotspur)  Adidas F50 Adizero Blackout Some change football boots, others change club. Roberto Soldado has gone from the Costa del Sol and Valencia to North London and Spurs, a change of scenery to say the least, but he sticks with his good old Adidas F50 Adizero. He had however had them blackouted, for his home debut against Espanyol  which proved to do the trick, as he scored. It may have been on a penalty, but it secured the 1-1 result. 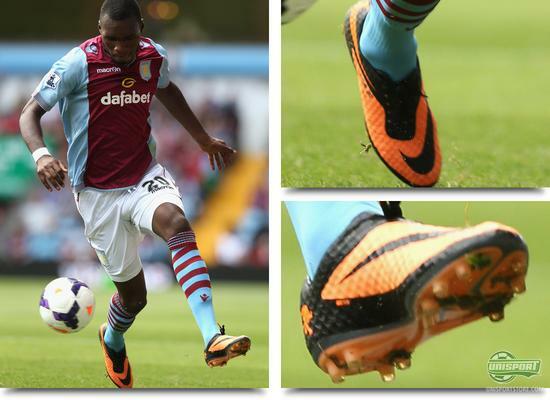 Christian Benteke (Aston Villa)  Nike Hypervenom Phantom Bright Citrus/Black One player who is also quite accustomed to goals, is the Aston Villa man-mountain Christian Benteke. In the weekends game against Champions League quarter finalists, Malaga, he once again proved too hot to handle. The Spanish defenders had no answer for his daunting size and wearing his new Hypervenom Phantom, which he has switched to from the Nike Tiempo Legend IV, he scored twice, with particularly the first of the goals being a pearler. It will be exciting to see whether he can make life difficult for the Arsenal defense, when the Premier League kicks off on Saturday. Marlon Pack (Bristol City)  Nike Premier Black/White & Billy Daniels (Coventry City)  Adidas Nitrocharge 1.0 Black/Electricity/Metallic Silver It is however not just in the Premier League that the football is going at full throttle. In the weekend Bristol City played against Coventry City, and even though the game might not have been one that received much international attention, it was a cracker none the less. A nine goal thriller, spiced up by the Coventry fans protesting outside the stadium and just to add to the excitement, there were boot spots in abundance. Marlon Pack sported the new Nike Premier, while Billy Daniels from Coventry was his teams #TheEngine and worked in his Adidas Nitrocharge 1.0. Leon Clarke (Coventry City)  Nike Mercurial VIII CR7 It was also interesting to see Leon Clark with a slightly atypical choice. Whether it is because he hopes to be as good as Cristiano Ronaldo, or he just likes the boots remains unknown, but he was definitely wearing the Portuguese superstars exclusive boots. Interesting to see that not everyone has gone over to wearing the new Nike Mercurial Vapor IX, or the Nike Hypervenom Phantom. James McClean (Wigan)  Nike Hypervenom Phantom Bright Citrus/Black Always a favourite here at the Unisport HQs is James McClean. 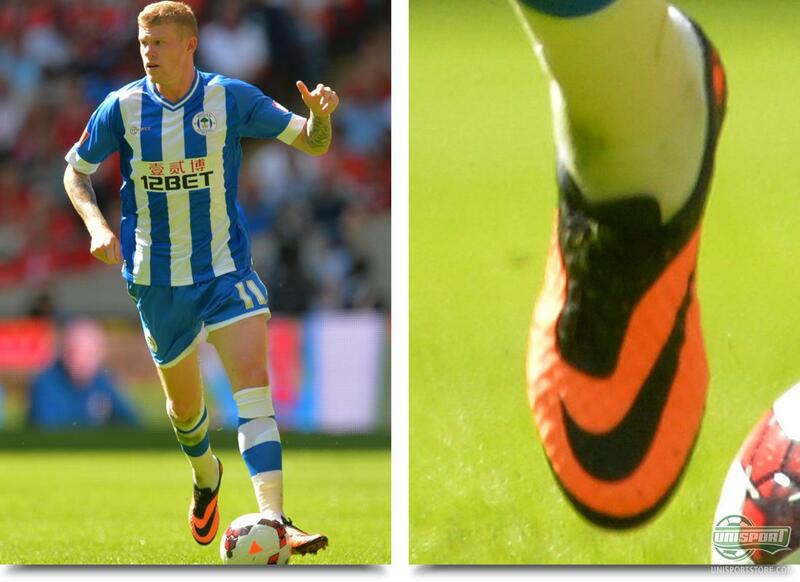 Even though McClean is a decent footballer, it is not always his football play that catches our attention. The good James McClean is known for being almost as obsessed with what he wear on his feet, as we are and trust us when we say that is saying something. We have seen him in the Nike Mercurial Vapor 15th Anniversary boot, as well as the Vapor III. In this weekends Community Shield match he however wore the new Nike Hypervenom and it probably won't be long before we see him in a cool NikeID version of it either. Jonathan Dos Santos (FC Barcelona)  Warrior Skreamer Blackout We finish this round of boot spots in Barcelona. Here Jonathan Dos Santos is one of the players, who the Blaugrana are hoping takes the leap onto the big scene. He may still be young, but he has already proven that he knows how to treat a football. He does so in his Warrior Sports Skreamer, which have even been given an elegant blackout treatment. Therefore he has also already chosen sides in this summers big battle: Colourful or classic boots. 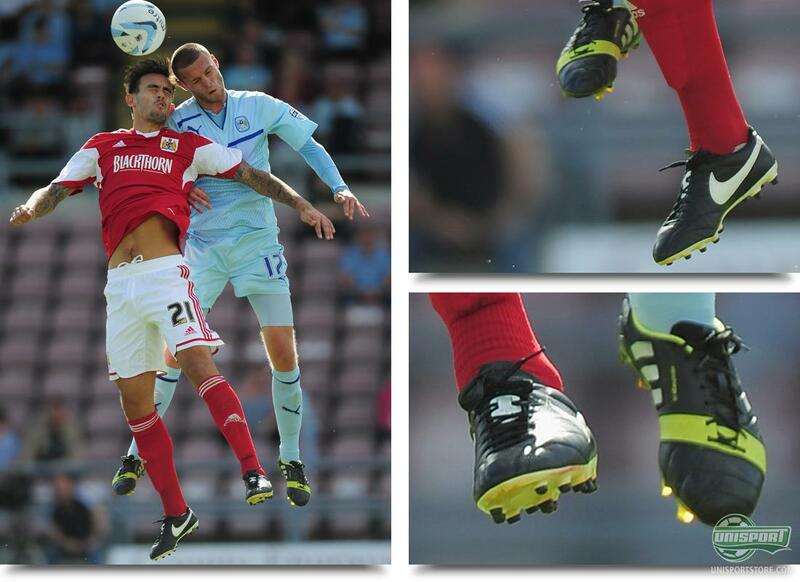 This weeks boot spots offered maybe a first look at a new Puma-boot, as well as plenty of blackout boots. We are really looking forward to the start of the new Premier League, where there are hopefully plenty more cool spots on show. What do you think of this round of boot spots? Have you spotted something we missed? As always we would love to hear your thoughts in the comment-section down below, or on Facebook and Twitter.